Vasu Gounden is the Founder and Executive Director of the African Centre for the Constructive Resolution of Disputes (ACCORD), based in Durban, South Africa. For the last five years ACCORD has been ranked as one of the top 100 Think Tanks in the world by the Global Go to Think Tank Index of Pennsylvania University. 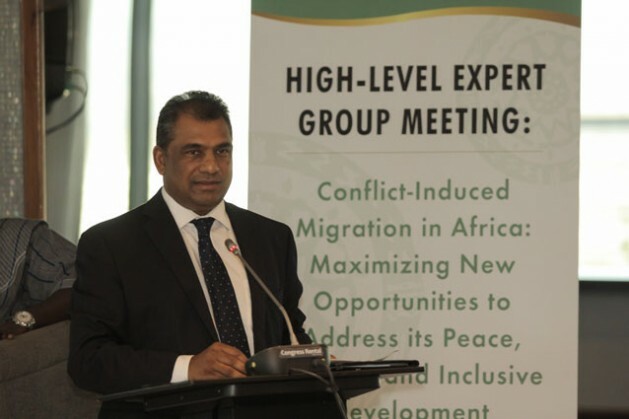 Vasu Gounden, ACCORD's Chief, addresses high level expert group on climate and migration. DURBAN, Dec 22 2015 (IPS) - On 21 November 2015, during ACCORD’s 2015 Africa Peace Award celebration, I made a call for the United Nations to convene the first ever UN Global Conference on Peace. The call was made during the presentation of the Africa Peace Award to the African Union Commission (AUC), in recognition of its central role in contributing to peace and promoting development in Africa. The award was made at a gala dinner by the Chairperson of ACCORD, Madame Graca Machel, and received on behalf of the AUC by Dr Nkosazana Dlamini-Zuma, Chairperson of the AUC. Over the past few months, our television screens and social media have again exposed us to the graphic nightmares currently plaguing humanity. Terrorism, violent uprisings, and devastating conflicts now afflict several parts of the world, with no corner of our planet immune to either these challenges or their consequences. Conflicts throughout the world have multiplied in complexity and intensity. The previous paradigm of warfare, where two nations fight one another across borders, is no longer the norm. Today internal conflicts around a number of grievances dominate, and are complicated by the rapid expansion of amorphous groups of radicalised and militant individuals. As evidenced by the current challenges in Syria and Iraq, Libya, Nigeria, Yemen and Ukraine, the consequences of the violence are devastating and will scar these societies for generations to come. Our global community can no longer afford to pursue exclusively military-oriented responses, nor can states afford to remain indifferent to situations that are beyond their immediate concerns or borders. We need a new paradigm for peace. With an exponentially growing population, unprecedented urbanisation often into unplanned cities, destabilising climate change, a shaky global financial system, growing unemployment, mass migration, and expanding wealth inequality, our planet is in a race against time to create a sustainable future and prevent these global challenges from accelerating and entrenching global instability. As our work on climate change has shown, challenges such as these can trigger conflict and so even adaptation measures need to be conflict sensitive. While humanity is equipped with unprecedented technological advancements and incredible demographic opportunities to build a better future, we must channel the collective expertise of our global community to find sustainable and transformative pathways forward. The need for sustainable global peace is urgent and the stakes are rising as the challenges deepen. The choice of inaction could close the door on the future for which many strive. We must act quickly! Collective political dialogue is the only true pathway to begin addressing inter-connected challenges in a sustainable and holistic manner. Over our 23-year history and through engagements with governments, armed groups, civil society, and regional, continental, and multi-lateral bodies, ACCORD has found this maxim to be true. Our global systems for peace have grown more fragile and stressed just as our conflicts and challenges have evolved with ever increasing complexity. Our dialogue must focus on strategies to resolve current crises, prevent future deterioration, and ensure that peace and prosperity finally take root equitably and sustainably. Further, an urgent need exists to promote critical reflection, earnest debate and mutual solidarity amongst all people. We must underpin these efforts by shepherding a collective shift from an exclusive focus on ‘national interest’ to a collective focus on ‘global responsibility’. There are no easy answers, and no nation on its own has the solution for the challenges of today and more importantly the challenges of tomorrow. Since its inception the United Nations has convened a number of World Conferences. However, to this day there has not been a UN-sponsored World Conference focused explicitly on peace. Bringing the entire community of humanity under one forum to deliberate earnestly has in the past contributed to tangible landmark global commitments from governments, the private sector and non-state actors alike. Our institutions and processes often limit discussion but a global conference creates a space where all are placed on an equal footing. Many of the current achievements on human rights, social development, climate change, and gender were built on the fresh foundations created by global conferences and dialogue. Such foundations create paradigm shifts, which then lead to practical outcomes. It is our hope therefore that the Republic of South Africa, in collaboration with other African nations and under the auspices of the African Union, can propose to the UN General Assembly to host the first ever UN Global Conference on Peace in 2019 in Durban, on the 25th anniversary of South Africa’s democracy. In advance of such a UN Global Conference on Peace and to support a global debate on peace we intend to assemble a multi-disciplinary gathering of experts from around the world in 2017, two years prior to the UN gathering. As we face our future together we remember that South Africa’s peaceful transition was the result of collective global action and the struggle and outcome gave inspiration and courage to many. Unanimous and collective opposition to apartheid, from Africa and beyond, were critical in supporting the emergence of a peaceful and democratic South Africa against expectations and great odds. We therefore call the entire world to join once more in a free and peaceful South Africa, in the same spirit of collective unity, to begin charting a way forward to deliver global peace.